Can an app help you cook better? In terms of ultimate life goals, it might be a shallow question. Then again, if you’ve spent any time on the patio cooking in front of teenagers and young adults, then burned a steak or undercooked a hamburger, you know there is a lot of consternation involved. 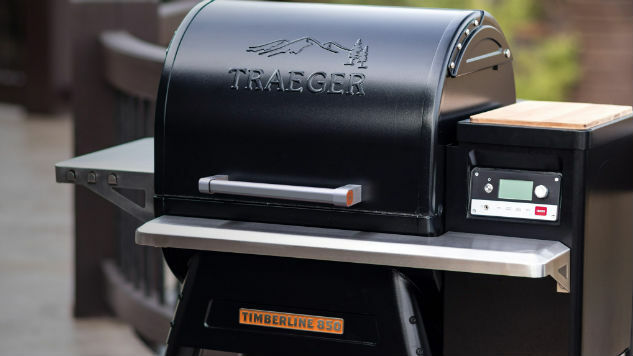 Recently, I tested out the Traeger Timberline 850 wood-fire grill, which has a digital display to help you adjust the settings and uses an app that makes cooking easier—and more enjoyable. I started out feeling a little incredulous about apps for grilling, but ended up with some tasty choice cuts that made me think this is a smart idea for grilling newbies like me. To start out, I asked Omaha Steaks to help out—they sent me a few steaks to cook because, to be honest, this is a time-consuming and laborious process. I’ll leave it up to you if you want to feel sorry for me. I wanted to test burgers, a filet mignon or two, and some T-bone steaks. Each cut requires a different setting and cook-time, and part of the issue here is that I wanted to see if the Timberline helped me cook more proficiently and with better results. Setting up the grill is easy, although it weighs around 213 pounds so I had to find help. Fortunately, the app synced to my iPhone 7 Plus without a lot of steps, essentially broadcasting a Wi-Fi network from the grill that let me connect initially, then walking me through how to configure the grill to use my own Wi-Fi signal, all in about five minutes. The app has two main purposes. You can use it to monitor the grill temperature and then to remind me (with a chime or a notification) about when the meat is done. I learned a lot through this process, because cooking steaks, burgers, and other meats is all about the desired temp, both for optimal results and then to know when the meat is ready to serve. On the grill itself, I set the temperature using a digital dial. You have to set the temp then push, which is maybe a little unintuitive. (I’d prefer if moving the dial worked like a stove and you just turn and then leave it to use that temp.) Not a big deal. I then placed my meat inside and started using the app. It worked really well because Traeger seems to know that the most annoying thing about cooking on a grill is the babysitting—opening the hot lid, checking the meat, flipping the meat. Who has the time? Using the app, I could walk away and check my garden or post a few jokes on my Twitter feed, then go back as the temp changed for a quick meat flip. I found that with two T-bone steaks layered with some nice fat along the edge (which helps with flavor), the results were better because I was able to monitor the grill easier. When the steaks hit the desired temp, using the included probe, I knew it was time to eat. Once, when cooking hamburgers, I forgot about how quickly they cook—so the chime on my phone was a good reminder. You can disable the chime and notifications if you want, but they saved me from a burned dinner. Ironically, it made me want to grill more because I didn’t have to sit right next to the grill the whole time. My only minor issues with the Timberline is that the setup process is a little cumbersome—you have to prep the grill following some specific steps, and I wanted the display on the grill or the app to walk me through that, not by using a printed manual. Also, the first time I used the grill, it smoked enough to make me think something was wrong (but don’t worry, it’s normal). And, I wasn’t quite as pleased with how the burgers turned out compared to a Charbroil model. The Traeger helped me cook luscious steaks to perfection, but I suspect hamburgers taste better when you cook them over an open flame and not with a wood-fire grill. Not a big deal—I ended up liking how the Timberline 850 helped me cook with more efficiency, sometimes a little longer to let the flavor soak in, and without as much constant monitoring. Make the next version will have a robot voice that gives me even more tips. “John, your steaks are done…” is going to be an awesome addition.